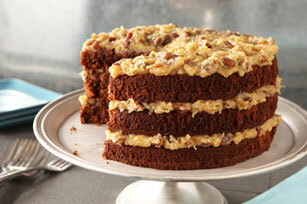 Chocolate cake with a coconut-pecan frosting? Yes, it's true - our BAKER'S Classic German Chocolate Cake is layered with a sweet frosting of flaked coconut and chopped pecans. Make sure you leave room for dessert! Cover bottoms of 3 (9-inch) round pans with waxed paper. Microwave chocolate and butter in large microwaveable bowl on MEDIUM 2 min. or until butter is melted; stir until chocolate is completely melted and mixture is well blended. Add sugar; beat with mixer until well blended. Add eggs, 1 at a time, beating on low speed after each until well blended. Mix flour and baking soda. Add to chocolate mixture alternately with buttermilk, beating well after each addition. Pour into prepared pans. Bake 25 min. or until toothpick inserted in centres comes out clean. Immediately run spatula around cakes. Cool in pans 15 min. ; remove from pans to wire racks. Remove waxed paper. Cool cakes completely. Meanwhile, prepare Coconut-Pecan Frosting. Beat egg yolks, evaporated milk and vanilla in large saucepan with whisk until well blended. Stir in sugar. Add butter; cook on medium heat until mixture comes to boil, stirring frequently. Cook and stir 8 to 10 min. or until golden brown. Remove from heat. Stir in coconut and nuts. Cool completely. Stack cakes on plate, filling layers and frosting top with Coconut-Pecan Frosting. If you don't have buttermilk, make your own. Just add 1 Tbsp. lemon juice to 1 cup 2% milk; let stand 5 min. Dessert can be part of a balanced diet but remember to keep tabs on portion size. This show stopping cake can also be baked in a greased and floured 13x9-inch pan. Just increase the baking time to 30 to 40 min. or until toothpick inserted in centre comes out clean. Cool cake in pan 15 min. ; invert onto wire rack. Cool completely. Transfer to platter. Frost top and sides with Coconut-Pecan Frosting.